Existing home sales continued to tumble for a fourth consecutive week according to the National Home Sales Snapshot released by DataQuick with more declines possible as mortgage applications for home purchases lag behind last year’s levels. There were 250,006 properties sold over the previous thirty-day rolling period ending October 10th, down 1.3 percent from the previous week’s total of 253,359 sold properties and 7.3 percent lower than the 269,817 properties sold four weeks ago, this year’s cycle peak. The decline in home sales should be expected to continue with the Mortgage Bankers Association reporting last week that mortgage applications for home purchases has dipped below last year’s levels for the past two weeks. Last week’s home sales volume was still 14.7 percent higher than the 217,984 homes sold during the same period a year ago and was 49.5 percent higher than during the same period three years ago when 167,196 homes were sold. The median price of a home sold over the current thirty-day rolling period decreased by $2,000 to $225,000 after falling by $2,500 the week before. 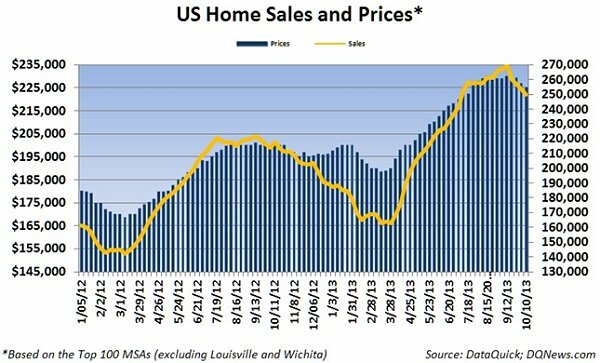 Four weeks ago the median home price was $230,000. Home prices were still 12.5 percent higher than during the same period a year ago when the median price of a home was $200,000 and were 15.4 percent higher than the median price of $195,000 during the same period three years ago.